Well, I don't think my tank is fully cycled, yet (I'm at day 33). The pH dropping to 6.0 probably stalled the process, along with some leftover plant decay (from before I had adequate lighting) and from new plants suffering from shipping. I had done some spotty water changes to try to bring up the pH and to get rid of as much decaying plant material as possible, and then the last couple of times added a small amount of bicarb with the water change. When I did this last kind of water change, I noticed that my ammonia went to 0.25ppm, nitrite 0.25ppm, and nitrate 5ppm. I added Amquel plus to protect the cardinals. I have to admit that the last time I added bicarbonate, the pH went up too quickly from 6.0 to 6.5 and I think this triggered an Ich infection. At least the pH has finally stabilized in the past couple of days. I started Seachem Paraguard yesterday (I had seen one spot on one cardinal the day before yesterday. Today I saw a different cardinal with a single spot, but none on the others). All cardinals are acting lively and healthy, feeding eagerly on Spirulina flakes and picking on the occasional detritus worm (not as many in the tank as before, now). I also added Nitromax (even if it's not ideal, I wanted to boost the system while I was treating with Paraguard, also to help bring down the ammonia/nitrite levels). Interestingly, before adding either the Paraguard or Nitromax yesterday, the parameters were: ammonia 0.25, nitrite 0, and nitrate 5. I have a lot of plants in the tank with fairly vigorous growth (had to prune some yesterday). I have only tested the pH today, but am planning to test the other parameters, later. -In this particular situation, I knew I wanted some plants that require better lighting. I would try to start out with the right lighting first to minimize plant die-off in the beginning. The AquaRay GroBeam 500 is working great for my 36 gallon bow front. If anyone is wondering, my plants are doing significantly better than when I had just the T-8 bulb that came originally with the tank. I use both of them, now. 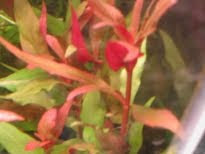 As an example, I have some Telanthera reineckii that, after about a third of it melting, is now growing well with the tops of the leaves bronze colored and the undersides very dark pink. -The Baylee's Better Bottom substrate (meant for plants) that I got on AquaBid.com has worked extremely well for me, so far, so I would use it again. I chose the very fine gravel for easier planting. -I would fill the tank with treated water, using Seachem Prime (I had avoided it because I had not read the label properly and thought that it coated the fish to give them a slime coat. I didn't want it to coat my Neocaridina shrimp that I have in my 5 gallon tank). I now realize I was wrong, Seachem Prime STIMULATES the slime coat PRODUCTION by the fish rather than choking the fish with some kind of Aloe vera-like coating all over, including the gills. At this point, I will just finish off the Amquel plus/API tap-water conditioner combination that I've been using, so far. This combination is a bit redundant, but the API tap-water conditioner neutralizes toxic metals while the Amquel plus does not. Seachem Prime does it all. -I would then let things run for 24 hours to let things settle a bit. The tank will be super cloudy at this point. -If I were smart and planned way ahead, I would have place the sponge and the ceramic chips from the new filter into my established tank 2 OR 3 WEEKS PRIOR to starting the new tank. OR If I had media that I could use from an old, non-infected tank, I would then use that in the new tank-- either filter media/sponge or gravel. -I would still add the driftwood from the established tank. Prior to adding any new/dry driftwood, I would soak it, like I did, for a long time in hot tap water with very frequent total water replacement (at least daily) until the water was not turning yellow much, anymore. Then, when I was ready to place it in the tank, I would soak it one more time but in treated water to get rid of any chlorine/chloramine. 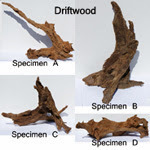 By the way, for any "newbies" reading, the new driftwood developed an unsightly translucent white film for a couple of weeks that eventually went away on its own (the old driftwood did not). Just leave the film alone-- you can't get rid of it manually anyway; all you will do is dislodge swaths of it that will float around your tank. If I didn't have any media I could use from an old tank, I would use one of the bacterial starters on the market. Of note: I had kind of started cycling the tank with fish food, but did not continue to add food daily, so I think the ammonia never adequately built up to get the nitrification started. I was concerned about pollution from the food itself. I also mistakenly thought that the decaying plants would provide the ammonia needed. I didn't realize that that decay was actually slowing the process. -Though I might add plants from day one, I would not add any frilly plants like Myriophyllum (frill), Hornwort, or Cabomba until later in the process when the nitrites would start to show. These fine leaved plants were the ones that disintegrated the most in the beginning and caused the pH crash. If I did add plants from the start, I would first choose Java Fern and/or Annubias, since these are tough plants that tend not to disintegrate so rapidly, if at all, under proper conditions. If there were any plant decay, I would promptly remove it (even with scissors or with a fish net, if necessary). -Then, I would let the system "roll", adding the necessary ammonia (see Carl's info on cycling tanks) until I would see those sought-after nitrites, followed by nitrate spikes... SIGH...... Also, I read online that water changes ARE advocated to maintain levels of ammonia not too much above 1ppm. This person did a little experiment and actually found that, not only were water changes OK, but the tank that had water changes done cycled faster by one day. (He had 2 tanks both fishless cycled from scratch, using ammonia drops- same dose in both tanks. One tank he left alone other than dosing ammonia, the other he maintained lower ammonia levels with water changes). By the way, this guy also advocated maximum water circulation to optimize oxygenation.